Educaching. What a fun concept. Let's take modern technology (GPS), a modern hobby (geocaching), and add national educational standards to make a fun, hands-on way to "do" education. As a member of The Old Schoolhouse Homeschool Crew, I received the ebook version of the Educaching manual. It is 128 pages, and is available to purchase for $32. It is also available already printed, at the same price (plus shipping). They have recently added classroom sets, which would include GPS and some other accessories. Teacher Training: eighteen pages introducing the terminology and the basic idea of the program. Lesson Plans: half the book is devoted to the 20 detailed lesson plans, going from beginner to advanced. 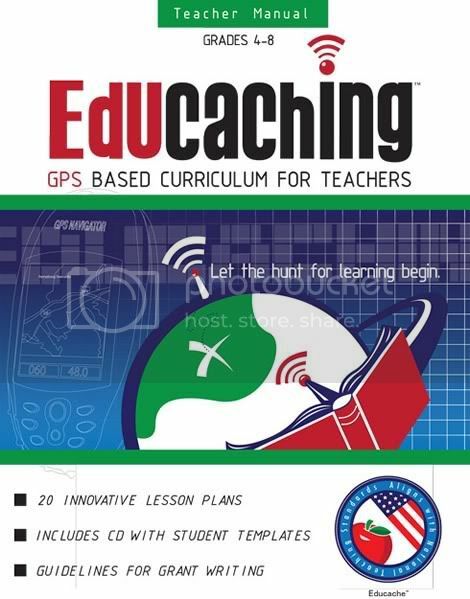 Acquiring GPS: a couple pages relating to funding a GPS purchase for your classroom. Beyond the Basics: Setting up clubs and more advanced activities. And what did I think? Well, I do like this. The author is a 5th grade teacher, and it is obvious that he does a great job of working with this age group. The ebook is pretty easy to read, and he takes you step by step through the process. As a teacher, though, his material is geared to a classroom setting, though most of it is simple to adjust for a "class" of only a couple students. The materials say they are for grades 4-8, and I think that is probably fairly accurate. I'd pick and choose a bit at either end of that range, and I think you could use the materials outside of the range too. As far as the actual activities, some of them are far too hokey for me to consider implementing, but I can certainly see the appeal in a classroom. If I want to have my children research careers in science, for instance, I'm going to have them pull up a list of careers, choose one, and research it. I'm not going to hide career names and clues in boxes on my property, find the coordinates, have my kids go search for those coordinates, and then do the research. We plan to follow up this activity by "building" Noah's Ark out back too. I haven't yet sat down to figure out what that means exactly, or how many arks would fit into Khufu's pyramid or anything, but I think that is going to be a lot of fun. And since we don't live on public property, we can keep our pyramid staked out for awhile. Overall, I think this is a terrific resource. I love the idea of integrating some activity into the schoolday, and getting some geography reinforced along the way is a huge plus. Also, I love being able to make use of the GPS for school -- and to have a starting point for coming up with even more ideas. This is a product I am thrilled to own. And the website includes lots of great resources as well... and samples. Check it out!